New: Battery check and Alarms, MPU Icon. See also Readme file inside sketch folder. I added an txt file to Github which explains the states a bit more. New: RTC Alarm System used. See thread entry below and the New Dokumentation TapClock_v0.8.2_ReadMe.txt file inside the sketch folder. Changed Menu Values (Watchface) are not stored in EEPROM. After a reboot these setting are back to normal. v0.5.7 with Time Menu and Stats Page. The Sketch needs MPU calibrating values which you can create with the WatchX_IMU_Zero_0x69.ino sketch avalible at my Github Repo. If WatchX is connected to USB Power the System will never go to sleep if it’s awaken. You can wait until the display is powerred off and then connect USB Power for charging without “display on”. Charging is shown through an glowing right side Led. If WatchX is on Battery, the system waits for 5 secs (const long clocktime = 5000;) then send the MCU into “SLEEP_MODE_PWR_DOWN”. The Interrupt from the MPU is configurred for waking the MCU on shaking or tapping. The motion values for shaking or tapping are actually fixed in sketch. 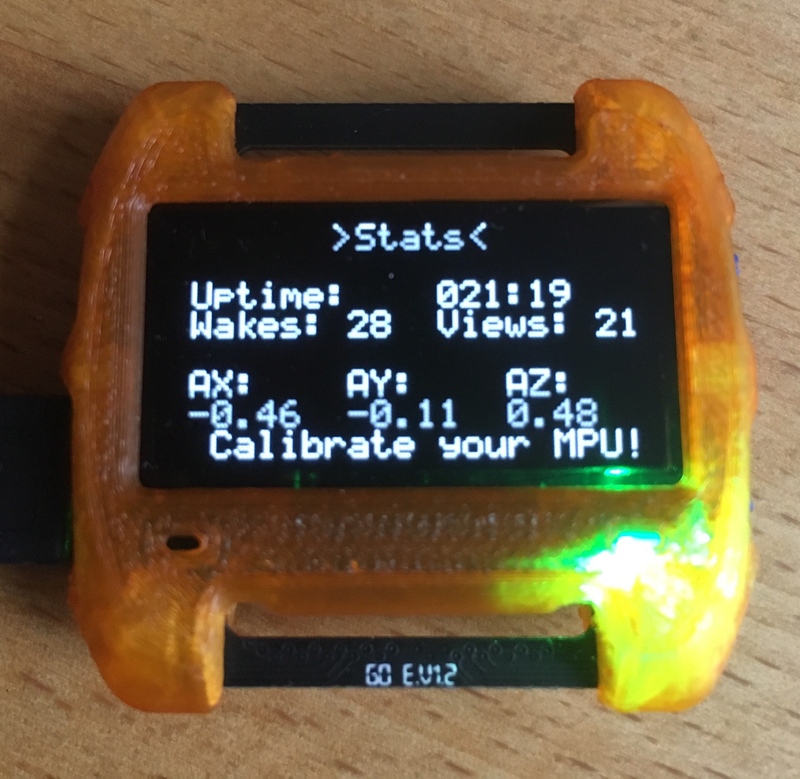 To get proper Angle values from the MPU you need to calibrate your MPU. To show the time the system needs to be woken up. After this the clock must be moved to two positions configured in the sketch to show the time (maybe i have to changed this). Now the time should be shown. If you don’t do this within the clocktime the system goes back to sleep. The Stats Menu can be used to show the needed angle values. If Clock is shown ULB opens the Menu for setting the time. See also the Readme on Github. The cover is Transparent PLA Painted with Tamiya Color Spray. Inspired by the Odroid-Go community on Reddit. P.S.S Sorry can’t add more Pictures or Links to this Post. I loved the breathing effect while charging:) however I am having trouble to see the watch. I calibrated the watchX but still having difficulty My stats show 33 wakes and 6 views. Maybe my calibration routine is not right. I uploaded the calibration sketch, put the watchX stand still and it calibrated. Keeping the watchX awake while USB connected is very clever. We need to import this feature to basic watch as well. into the TapClock sketch and replace my values with yours as each MPU is different. You have to choose one of the calibration values for each section. show nearly 0 at each axe if the WatchX lies on a flat and horizontal surface. and use a flat and horizontal surface for calibration. I added WordClock’s Watchface which you can choose from the Setup Menu. Watchface Value: 1=TapClock Watchface, 2=WordClock Watchface. The Timer for the Sleepmode (Clocktime) is also adjustable in 1/10sec steps from the setup. 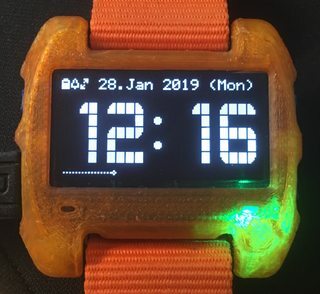 Added a third Watchface BlockClock based on the new font. See Font for Greiman Library (with Battery Symbols) for details. I am now at 93% storage. Include “Clock5x7.h” Font file through the sketch or library System instead of modifying the SSD1306ASCii library. I have a better battery duration. I know, the MPU needs around 50% of the the total battery usage. I had tried your BLE Power reducing tips but nothing really helps. Thats more or less what TapClock with MPU WakeUp does. The MPU Interrupt wakes up the system and the sketch checks two different watch positions before the display is powerd on. You only need to replace the MPU WakeUp with an timer wakeup. Hi there, this is my favorite firmware right now! I have finally printed a decent case so I can wear the watchx on a regular basis. I have also deactivated mpu like mtulu has, in order to have more runtime. First I thought, maybe I was too impatient and just let it sit for about 15 minutes after reuploading the sketch, but still nothing was sent over serial. there are also no leds lighting apart from the short breathing when the hardware is reset via button press. Is there anything I need to be aware of that needs to be configured in the sketch? should I simply wait longer? Is there anything I need to be aware of that needs to be configured in the sketch? should I simply wait longer? The calibration sketch uses the serial at 9600 baud, make sure your terminal is correctly set. The sketch is waiting for the serial connection before it proceeds, double check your available interfaces after start of the sketch as well. Initializing I2C devices… in the terminal window. hmm the baud rate default was 9600 so I think that is not the problem. I will try again and fiddle a bit more with the serial monitor. maybe it’s a stupid thing I was missing. Haven’t done a lot of arduino development, so I am not familiar with the built in serial monitor yet. good to know, that the sketch is waiting for a connection. thanks! I uploaded v0.8.0 of TapClock to Github. The New Dokumention is the TapClock_v0.8.0_ReadMe.txt file inside the Sketch folder. I uploaded v0.8.2 of TapClock to Github. I am now at 93% Memory with BlockClock Watchface so I can’t add nothing big. Which is Low Battery Warning. If you have an idea how to check the battery if the system is on sleep let me know. Maybe it’s enough if battery check is done on every wakeup.